The Wizard of Oz is a 1939 American musical fantasy film produced by Metro-Goldwyn-Mayer, currently distributed by Warner Bros. Pictures. Widely considered to be one of the greatest films in cinema history, it is the best-known and most commercially successful adaptation of L. Frank Baum's 1900 children's book The Wonderful Wizard of Oz. 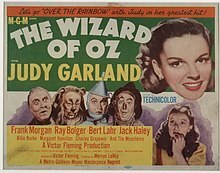 Directed primarily by Victor Fleming (who left production to take over the troubled production of Gone with the Wind), the film stars Judy Garland as Dorothy Gale alongside Ray Bolger, Jack Haley, Bert Lahr. Characterized by its legendary use of Technicolor, fantasy storytelling, musical score, and memorable characters, the film has become an icon of American popular culture. It was nominated for six Academy Awards, including Best Picture, but lost to Gone with the Wind, also directed by Victor Fleming. It did win in two other categories: Best Original Song for "Over the Rainbow" and Best Original Score by Herbert Stothart. While the film was considered a critical success upon release in August 1939, it failed to make a profit for MGM until the 1949 re-release, earning only $3,017,000 on a $2,777,000 budget, not including promotional costs, which made it MGM's most expensive production at that time. The 1956 television broadcast premiere of the film on the CBS network reintroduced the film to the public; according to the Library of Congress, it is the most seen film in movie history. It was among the first 25 films that inaugurated the National Film Registry list in 1989. It is also one of the few films on UNESCO's Memory of the World Register. The film is among the top ten in the BFI list of the 50 films you should see by the age of 14. The Wizard of Oz is the source of many quotes referenced in contemporary popular culture. Noel Langley, Florence Ryerson, and Edgar Allan Woolf received credit for the screenplay, but uncredited contributions were made by others. The songs were written by Edgar "Yip" Harburg (lyrics) and Harold Arlen (music). The musical score and the incidental music were composed by Stothart. 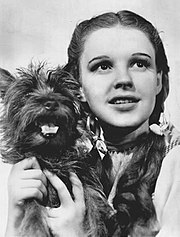 Dorothy Gale lives with her dog Toto on the Kansas farm of her Aunt Em and Uncle Henry. Toto bites Miss Almira Gulch on the leg, and she obtains an order from the sheriff for Toto to be euthanized. She takes Toto away on her bicycle, but he escapes and returns to Dorothy, and she decides to run away. She meets Professor Marvel, a kindly fortune teller who uses his crystal ball to make Dorothy believe that Aunt Em may be dying of a broken heart. Dorothy races home, arriving just as a tornado strikes. Locked out of the farm's storm cellar, she seeks shelter in her bedroom. Wind-blown debris knocks her unconscious and the house is sent spinning in the air. She awakens to see various figures fly by, including Miss Gulch on her bicycle, who transforms into a witch on a broomstick. The house lands in Munchkinland in the Land of Oz. Glinda the Good Witch of the North and the Munchkins welcome her as a heroine, as the falling house has killed the Wicked Witch of the East. Her sister, the Wicked Witch of the West, arrives to claim the slippers, but Glinda transports them onto Dorothy's feet first. The Wicked Witch of the West swears revenge on Dorothy, then vanishes. Glinda tells Dorothy to keep the slippers on and follow the yellow brick road to the Emerald City, where she can ask the Wizard of Oz to help her get back home. On her journey, Dorothy meets the Scarecrow, who wants a brain, the Tin Woodman, who desires a heart, and the Cowardly Lion, who needs courage. Dorothy invites them to accompany her to Emerald City, where they can ask the Wizard to help them too. Despite the Witch's attempts to foil their journey, they reach the Emerald City and are eventually permitted to see the Wizard, who appears as a large ghostly head surrounded by fire and smoke. He agrees to grant their wishes if they prove their worth by bringing him the Witch's broomstick. As the foursome and Toto make their way to the Witch's castle, the Witch captures Dorothy and plots her death in order to remove her slippers. Toto escapes and leads her three friends to the castle. They ambush three guards, don the guards' uniforms, march inside and free Dorothy. The Witch and her guards chase and surround them. The Witch sets fire to the Scarecrow, causing Dorothy to toss a bucket of water, inadvertently splashing the Witch, who melts away. The guards rejoice and give Dorothy her broomstick. The Wizard stalls in fulfilling his promises, until Toto pulls back a curtain and exposes the "Wizard" as a middle-aged man operating machinery and speaking into a microphone. Admitting to being a humbug, he insists that he is a good man but a bad wizard. He then gives the Scarecrow a diploma, the Lion a medal and the Tin Man a ticking heart-shaped watch, helping them see that the attributes they sought were already within them. He then offers to take Dorothy and Toto home in his hot air balloon. He reveals that he, too, is from Kansas, and worked at a carnival when a tornado brought him to the Emerald City. He was offered and accepted the job as Wizard due to hard times. As Dorothy and the Wizard prepare to depart, Toto, distracted by a cat, leaps from Dorothy's arms. As she pursues Toto, the balloon disembarks with the Wizard, leaving Dorothy. Glinda appears and tells Dorothy the ruby slippers have the power to return her to Kansas if she taps her heels together three times repeating "There's no place like home." Dorothy complies and wakes up in her bedroom surrounded by her family and friends, including Toto. Everyone dismisses her adventure as a dream, but Dorothy insists it was real and says she will never run away from home again. She then declares: "There's no place like home!" For a list of all the munchkin actors/actresses in the film, see Munchkin § Actors and actresses. 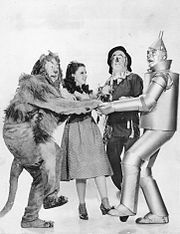 The Cowardly Lion, Dorothy, Scarecrow, and the Tin Man were the film's main characters. Frank Morgan as Professor Marvel/The Wizard of Oz/Emerald City Doorman/the Cabby/Emerald City Guard/The Wizard of Oz angry face projection. 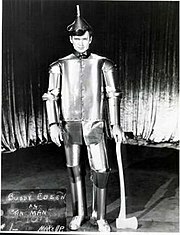 Vaudevillian star Jack Haley was given the role of the Tin Woodman, after Buddy Ebsen had an allergic reaction to the characters studio makeup. Production on the film began when Walt Disney's Snow White and the Seven Dwarfs (1937) showed that films adapted from popular children's stories and fairytale folklore could still be successful. In January 1938, Metro-Goldwyn-Mayer bought the rights to L. Frank Baum’s hugely popular novel from Samuel Goldwyn, who had toyed with the idea of making the film as a vehicle for Eddie Cantor who was under contract to the Goldwyn studios and whom Goldwyn wanted to cast as the Scarecrow. The script went through a number of writers and revisions before the final shooting. Mervyn LeRoy's assistant William H. Cannon had submitted a brief four-page outline. Because recent fantasy films had not fared well, he recommended that the magical elements of the story be toned down or eliminated. In his outline, the Scarecrow was a man so stupid that the only employment open to him was literally scaring crows from cornfields and the Tin Woodman was a criminal so heartless he was sentenced to be placed in a tin suit for eternity; this torture softened him into somebody gentler and kinder. His vision was similar to Larry Semon's 1925 film adaptation of the story in which the magical elements are absent. Afterwards, LeRoy hired screenwriter Herman J. Mankiewicz, who soon delivered a 17-page draft of the Kansas scenes and a few weeks later, a further 56 pages. Noel Langley and poet Ogden Nash were also hired to write separate versions of the story. None of these three knew about the others, and this was not an uncommon procedure. Nash delivered a four-page outline, Langley turned in a 43-page treatment and a full film script. He[who?] turned in three more, this time incorporating the songs that had been written by Harold Arlen and Yip Harburg. Florence Ryerson and Edgar Allan Woolf submitted a script and were brought on board to touch up the writing. They would be responsible for making sure the story stayed true to the Baum book. However, producer Arthur Freed was unhappy with their work and reassigned it to Langley. During filming, Victor Fleming and John Lee Mahin revised the script further, adding and cutting some scenes. In addition, Jack Haley and Bert Lahr are known to have written some of their own dialogue for the Kansas sequence. The final draft of the script was completed on October 8, 1938, following numerous rewrites. All in all, it was a mish-mash of many creative minds, but Langley, Ryerson, and Woolf got the film credits. Along with the contributors already mentioned, others who assisted with the adaptation without receiving credit include: Irving Brecher, Herbert Fields, Arthur Freed, Yip Harburg, Samuel Hoffenstein, Jack Mintz, Sid Silvers, Richard Thorpe, Cukor and Vidor. The original producers thought that a 1939 audience was too sophisticated to accept Oz as a straight-ahead fantasy; therefore, it was reconceived as a lengthy, elaborate dream sequence. Because of a perceived need to attract a youthful audience through appealing to modern fads and styles, the score had featured a song called "The Jitterbug", and the script had featured a scene with a series of musical contests. A spoiled, selfish princess in Oz had outlawed all forms of music except classical and operetta, and went up against Dorothy in a singing contest in which her swing style enchanted listeners and won the grand prize. This part was initially written for Betty Jaynes. The plan was later dropped. Much attention was given to the use of color in the production, with the MGM production crew favoring some hues over others. It took the studio's art department almost a week to settle on the shade of yellow used for the yellow brick road. Garland won the role of Dorothy despite substantial competition. LeRoy had always insisted that he wanted to cast Judy Garland to play Dorothy from the start; however, evidence suggests that negotiations occurred early in pre-production for Shirley Temple to be cast as Dorothy on loan from 20th Century Fox. A persistent rumor also existed that Fox in turn was promised Clark Gable and Jean Harlow as a loan from MGM. The tale is almost certainly untrue, as Harlow died in 1937, before MGM had even purchased the rights to the story. Despite this, the story appears in many film biographies (including Temple's own autobiography). The documentary The Wonderful Wizard of Oz: The Making of a Movie Classic states that Mervyn LeRoy was under pressure to cast Temple, then the most popular child star, but at an unofficial audition MGM musical mainstay Roger Edens listened to her sing and felt that an actress with a different style was needed; a 50th anniversary documentary for the film suggested that Temple, then 10-years-old, was slightly too young for the part. Newsreel footage is included in which Temple wisecracks, "There's no place like home", suggesting that she was being considered for the part at that time. A possibility is that this consideration did indeed take place, but that Gable and Harlow were not part of the proposed deal. Actress Deanna Durbin, who was under contract to Universal Pictures, was also considered for the part of Dorothy. Durbin, at the time, far exceeded Garland in film experience and fan base and both had co-starred in a 1936 two-reeler titled Every Sunday. The film was most notable for exhibiting Durbin's operatic style of singing against Garland's jazzier style. 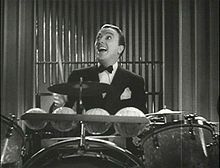 Durbin was possibly passed over once it was decided to bring on Jaynes, also an operatic singer, to rival Garland's jazz in the aforementioned discarded subplot of the film. Ebsen's first makeup test as the Tin Man. Ray Bolger was originally cast as the Tin Man and Buddy Ebsen was to play the Scarecrow. Bolger, however, longed to play the Scarecrow, as his childhood idol Fred Stone had done on stage in 1902; with that very performance, Stone had inspired him to become a vaudevillian in the first place. Now unhappy with his role as the Tin Man (reportedly claiming, "I'm not a tin performer; I'm fluid"), Bolger convinced producer Mervyn LeRoy to recast him in the part he so desired. Ebsen did not object; after going over the basics of the Scarecrow's distinctive gait with Bolger (as a professional dancer, Ebsen had been cast because the studio was confident he would be up to the task of replicating the famous "wobbly-walk" of Stone's Scarecrow), he recorded all of his songs, went through all the rehearsals as the Tin Man and began filming with the rest of the cast. W. C. Fields was originally chosen for the title role of the Wizard, a role turned down by Ed Wynn as he thought the part was too small, but the studio ran out of patience after protracted haggling over Fields' fee. Wallace Beery lobbied for the role, but the studio refused to spare him during the long shooting schedule. Instead, another contract player, Frank Morgan, was cast on September 22. An extensive talent search produced over a hundred little people to play Munchkins; this meant that most of the film's Oz sequences would have to already be shot before work on the Munchkinland sequence could begin. According to Munchkin actor Jerry Maren, the little people were each paid over $125 a week (equivalent to $2,200 today). Meinhardt Raabe, who played the coroner, revealed in the 1990 documentary The Making of the Wizard of Oz that the MGM costume and wardrobe department, under the direction of designer Adrian, had to design over 100 costumes for the Munchkin sequences. They then had to photograph and catalog each Munchkin in his or her costume so that they could correctly apply the same costume and makeup each day of production. Gale Sondergaard was originally cast as the Wicked Witch. She became unhappy when the witch's persona shifted from sly and glamorous (thought to emulate the wicked queen in Disney's Snow White and the Seven Dwarfs) into the familiar "ugly hag". She turned down the role and was replaced on October 10, 1938, just three days before filming started, by MGM contract player Margaret Hamilton. Sondergaard said in an interview for a bonus feature on the DVD that she had no regrets about turning down the part, and would go on to play a glamorous villain in Fox's version of Maurice Maeterlinck's The Blue Bird in 1940; Margaret Hamilton played a role remarkably similar to the Wicked Witch in the Judy Garland film Babes in Arms (1939). According to Aljean Harmetz, the "gone-to-seed" coat worn by Morgan as the wizard was selected from a rack of coats purchased from a second-hand shop. According to legend, Morgan later discovered a label in the coat indicating it had once belonged to Baum, that Baum's widow confirmed this, and that the coat was eventually presented to her. But Baum biographer Michael Patrick Hearn says the Baum family denies ever seeing the coat or knowing of the story; Hamilton considered it a concocted studio rumor. Filming commenced October 13, 1938 on the Metro-Goldwyn-Mayer studio lot in Culver City, California under the direction of Richard Thorpe (replacing original director Norman Taurog, who filmed only a few early Technicolor tests and was then reassigned). Thorpe initially shot about two weeks of footage (nine days in total) involving Dorothy's first encounter with the Scarecrow, as well as a number of sequences in the Wicked Witch's castle such as Dorothy's rescue (which though unreleased comprises the only footage of Ebsen's Tin Man). According to most sources, ten days into the shoot Ebsen suffered a reaction to the aluminum powder makeup he wore though he did recall taking a breath one night without suffering any immediate effect. He was hospitalized in critical condition and subsequently was forced to leave the project; in a later interview (included on the 2005 DVD release of The Wizard of Oz), he recalled the studio heads appreciated the seriousness of his illness only after seeing him in the hospital. Filming halted while a replacement for him was found. No full footage of him as the Tin Man has ever been released – only photographs taken during filming and makeup test photos. His replacement Jack Haley simply assumed he had been fired. Author and screen-writer George MacDonald Fraser offers an alternative story, told to him by Burt Lancaster's producing partner, Jim Hill, that Ebsen had refused to be painted silver and was fired. Bolger's original recording of "If I Only Had a Brain" had been far more sedate compared to the version heard in the film; during this time, Cukor and LeRoy decided that a more energetic rendition would better suit Dorothy's initial meeting with the Scarecrow (initially, it was to contrast with his lively manner in Thorpe's footage), and was rerecorded as such. At first thought to be lost for over seven decades, a recording of this original version was rediscovered in 2009. Cukor did not actually shoot any scenes for the film, merely acting as something of a "creative advisor" to the troubled production and because of his prior commitment to direct Gone with the Wind, he left on November 3, 1938 when Victor Fleming assumed directorial responsibility. As director, Fleming chose not to shift the film from Cukor's creative realignment, as producer LeRoy had already pronounced his satisfaction with the new course the film was taking. Production on the bulk of the Technicolor sequences was a long and exhausting process that ran for over six months, from October 1938 to March 1939. Most of the cast worked six days a week and had to arrive as early as 4:00 a.m. to be fitted with makeup and costumes, and often did not leave until 7 pm or later. Cumbersome makeup and costumes were made even more uncomfortable by the daylight-bright lighting the early Technicolor process required, which could heat the set to over 100 °F (38 °C). Bolger later said that the frightening nature of the costumes prevented most of the Oz principals from eating in the studio commissary; the toxicity of Hamilton's copper-based makeup forced her to eat a liquid diet on shoot days. It took as many as twelve takes to have Toto run alongside the actors as they skipped down the yellow brick road. In Hamilton's exit from Munchkinland, a concealed elevator was arranged to lower her below stage as fire and smoke erupted to dramatize and conceal her exit. The first take ran well, but in the second take the burst of fire came too soon. The flames set fire to her green, copper-based face paint, causing third-degree burns on her hands and face. She spent three months healing before returning to work. 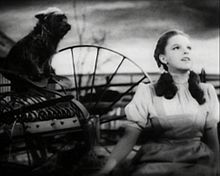 On February 12, 1939, Fleming hastily replaced Cukor in directing Gone with the Wind; the next day, King Vidor was assigned as director by the studio to finish the filming of The Wizard of Oz (mainly the sepia-toned Kansas sequences, including Garland's singing of "Over the Rainbow" and the tornado). In later years, when the film became firmly established as a classic, Vidor chose not to take public credit for his contribution until after the death of his friend Fleming in 1949. The Cowardly Lion and Scarecrow masks were made of foam latex makeup made by makeup artist Jack Dawn, who was one of the first makeup artists to use this technique. The actor who played Scarecrow was left with permanent lines around his mouth and chin from his mask. It took an hour each day to slowly peel the glued-on mask from Bolger's face. Margaret Hamilton received severe burns on her hands and face when there was an accident with the fire while filming her exit from Munchkinland. Hamilton was wearing her green makeup at the time, which was usually removed with acetone due to the toxicity of its copper content. In this case, due to Hamilton's burns, makeup artist Jack Young removed the makeup with alcohol instead to prevent infection. The Tin Man's costume was made of leather-covered buckram and the oil used to grease his joints was made from chocolate syrup. The Cowardly Lion's costume was made from real lion skin and fur. For the "horse of a different color" scene, Jell-O powder was used to color the white horses. Asbestos was used to achieve some of the special effects like the witch's burning broomstick and the fake snow that covers Dorothy as she sleeps in the field of poppies. Herbert Stothart conducts the MGM Studio Orchestra for The Wizard of Oz, which was recorded at the MGM studios. The film is widely noted for its musical selections and soundtrack. The music was composed by Harold Arlen, and the lyrics were written by Yip Harburg, both of whom won the Academy Award for Best Original Song for "Over the Rainbow". The song was ranked first in two lists: the AFI's 100 Years...100 Songs and the Recording Industry Association of America's "365 Songs of the Century". The songs were recorded in the studio's scoring stage before filming. Several of the recordings were completed while Ebsen was still with the cast. Therefore, while he had to be dropped from the cast due to illness from the aluminum powder makeup, his singing voice remained in the soundtrack (as noted in the notes for the CD Deluxe Edition). In the group vocals of "We're Off to See the Wizard", his voice can be heard. Haley spoke with a distinct Boston accent, thus did not pronounce the r in wizard. By contrast, Ebsen was a Midwesterner, like Garland, and pronounced it. Haley rerecorded Ebsen's solo parts later. Garland singing "Over the Rainbow"
"The Jitterbug" – Although this song was removed from the final film, it is still available on some extended edition CDs. Some musical pieces filmed were deleted in the editing process. The song "The Jitterbug", written in a swing style, was intended for the sequence in which the group is journeying to the Witch's castle. Due to time constraints, the song was cut from the final theatrical version. The film footage for the song has been lost, although silent home film footage of rehearsals for the number has survived. The sound recording for the song, however, is intact and was included in the two-CD Rhino Records deluxe edition of the film soundtrack, as well as on the VHS and DVD editions of the film. A reference to "The Jitterbug" remains in the film: the Witch remarks to her flying monkeys that they should have no trouble apprehending Dorothy and her friends because "I've sent a little insect on ahead to take the fight out of them." Another musical number cut before release occurred right after the Wicked Witch of the West was melted and before Dorothy and her friends returned to the Wizard. This was a reprise of "Ding-Dong! The Witch Is Dead" (blended with "We're Off to See the Wizard" and "The Merry Old Land of Oz") with the lyrics altered to "Hail! Hail! The Witch is Dead!" This started with the Witch's guard saying "Hail to Dorothy! The Wicked Witch is dead!" and dissolved to a huge celebration of the citizens of the Emerald City singing the song as they accompany Dorothy and her friends to see the Wizard. Today, the film of this scene is also lost and only a few stills survive, along with a few seconds of footage used on several reissue trailers. The entire audio still exists and is included on the two-CD Rhino Record deluxe edition of the film soundtrack. In addition, a brief reprise of "Over the Rainbow" was intended to be sung by Garland while Dorothy is trapped in the Witch's castle, but it was cut because it was considered too emotionally intense. The original soundtrack recording still exists, however, and was included as an extra in all home media releases from 1993-onwards. Excerpts from Schumann's "The Happy Farmer", at several points early in the film, including the opening scene when Dorothy and Toto are hurrying home after their encounter with Miss Gulch, when Toto escapes from her, and when the house is "riding" the tornado. An excerpt of Mendelssohn's "Opus 16, #2", when Toto escapes from the Witch's castle. An excerpt of Mussorgsky's "Night on Bald Mountain", when Dorothy, the Scarecrow, the Tin Man, and the Cowardly Lion are trying to escape from the Witch's castle. "In the Shade of the Old Apple Tree", when Dorothy and the Scarecrow discover the anthropomorphic apple trees. "Gaudeamus Igitur" during the Wizard's presentation of awards to the group. "Home! Sweet Home! ", in part of the underscore of the closing scene, at Dorothy's house in Kansas. Principal photography concluded with the Kansas sequences on March 16, 1939; nonetheless, reshoots and pick-up shots were filmed throughout April and May and into June, under the direction of producer LeRoy. After the deletion of the "Over the Rainbow" reprise during subsequent test screenings in early June, Garland had to be brought back one more time to reshoot the "Auntie Em, I'm frightened!" scene without the song; the footage of Blandick's Aunt Em, as shot by Vidor, had already been set aside for rear-projection work, and was simply reused. After Hamilton's torturous experience with the Munchkinland elevator, she refused to do the pick-ups for the scene in which she flies on a broomstick that billows smoke, so LeRoy chose to have stand-in Betty Danko perform the scene, instead; as a result, Danko was severely injured doing the scene due to a malfunction in the smoke mechanism. At this point, the film began a long arduous post-production. Herbert Stothart had to compose the film's background score, while A. Arnold Gillespie had to perfect the various special effects that the film required, including many of the rear projection shots. The MGM art department also had to create the various matte paintings for the background of many of the scenes. Test screenings of the film began on June 5, 1939. Oz initially ran nearly two hours long. LeRoy and Fleming knew that at least 15 minutes needed to be deleted to get the film down to a manageable running time; the average film in 1939 ran for just about 90 minutes. Three sneak previews in Santa Barbara, Pomona and San Luis Obispo, California, helped guide LeRoy and Fleming in the cutting. Among the many cuts were "The Jitterbug" number, the Scarecrow's elaborate dance sequence following "If I Only Had a Brain", reprises of "Over the Rainbow" and "Ding-Dong! The Witch Is Dead", and a number of smaller dialogue sequences. This left the final, mostly serious portion of the film with no songs, only the dramatic underscoring. One song that was almost deleted was "Over the Rainbow". MGM had felt that it made the Kansas sequence too long, as well as being far over the heads of the target audience of children. The studio also thought that it was degrading for Garland to sing in a barnyard. LeRoy, uncredited associate producer Arthur Freed and director Fleming fought to keep it in, and they all eventually won. The song went on to win the Academy Award for Best Song of the Year, and came to be identified so strongly with Garland herself that she made it her theme song. The Hollywood premiere was on August 15, 1939, at Grauman's Chinese Theatre. The New York City premiere, held at Loew's Capitol Theatre on August 17, 1939, was followed by a live performance with Garland and her frequent film co-star Mickey Rooney. They continued to perform there after each screening for a week, extended in Rooney's case for a second week and in Garland's to three (with Oz co-stars Ray Bolger and Bert Lahr replacing Rooney for the third and final week). The film opened nationwide on August 25, 1939. The film was released multiple times for the home-video commercial market (on a limited scale) on Super 8 film (8 mm format) during the 1970s. These releases include an edited English version (roughly 10 minutes, and roughly 20 minutes), as well as edited Spanish versions of the classic. Also, a full commercial release of it was made on Super 8 (on multiple reels) that came out in the 1970s, as well, for the commercial market. The film was among the first videocassettes (on both VHS and Betamax format for the 1980 release) by MGM/CBS Home Video in 1980; all current home video releases are by Warner Home Video (via current rights holder Turner Entertainment). The first LaserDisc release of it was in 1982, with two versions of a second (one from Turner and one from The Criterion Collection with a commentary track) for the 50th anniversary release in 1989, a third in 1991, a fourth in 1993, a fifth in 1995 and a sixth and final LaserDisc release on September 11, 1996. In addition to VHS (and later, LaserDisc), the film has been released multiple times during the 1980s on the Betamax format, beginning in 1980 simultaneously with the VHS release. The film was released for the first and only time on the CED format in 1982 by MGM/UA Home Video. Outside of the North American and European markets, the film has also been released multiple times on the Video CD format since the 1990s in Asia. The first DVD release was on March 26, 1997, by MGM/Turner and contained no special features or supplements. It was re-released by Warner Bros. for its 60th anniversary on October 19, 1999, with its soundtrack presented in a new 5.1 surround sound mix. The DVD also contained a behind-the-scenes documentary, The Wonderful Wizard of Oz: The Making of a Movie Classic, produced in 1990 and hosted by Angela Lansbury, which was originally shown on television immediately following the 1990 telecast of the film; it had been featured in the 1993 "Ultimate Oz" LaserDisc release. Outtakes, the deleted "Jitterbug" musical number, clips of pre-1939 Oz adaptations, trailers, newsreels, and a portrait gallery were also included, as well as two radio programs of the era publicizing the film. In 2005, two DVD editions were released, both featuring a newly restored version of the film with an audio commentary and an isolated music and effects track. One of the two DVD releases was a "Two-Disc Special Edition", featuring production documentaries, trailers, various outtakes, newsreels, radio shows and still galleries. The other set, a "Three-Disc Collector's Edition", included these features, as well as the digitally restored 80th-anniversary edition of the 1925 feature-length silent film version of The Wizard of Oz, other silent Oz adaptations and a 1933 animated short version. 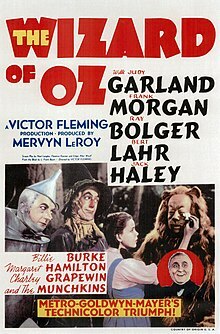 The film was released on Blu-ray on September 29, 2009, for its 70th anniversary in a four-disc "Ultimate Collector's Edition", including all the bonus features from the 2005 Collector's Edition DVD, new bonus features about Victor Fleming and the surviving Munchkins, the telefilm The Dreamer of Oz: The L. Frank Baum Story, and the miniseries MGM: When the Lion Roars. For this edition, Warner Bros. commissioned a new transfer at 8K resolution from the original negatives. The restoration job was given to Prime Focus World. This restored version also features a lossless 5.1 Dolby TrueHD audio track. In 2013, the film was re-released on DVD, Blu-ray, Blu-ray 3D and UltraViolet for the 90th anniversary of Warner Bros. and as part of its 75th anniversary. Also, multiple special editions were released in celebration of the film's the 75th anniversary in 2013, exclusively by both Best Buy (a SteelBook of the 3D Blu-ray) and another version that came with a keepsake lunch bag released by Target stores. This lobby card for the 1955 re-release carried a then-contemporary image of Garland. For the film's then-upcoming 60th anniversary, Warner Bros. Pictures released a "Special Edition" on November 6, 1998, digitally restored with remastered audio. In 2002, the film had a very limited re-release in U.S. theaters, earning only $139,905. On September 23, 2009, the film was rereleased in select theaters for a one-night-only event in honor of its 70th anniversary and as a promotion for various new disc releases later in the month. An encore of this event was released in theaters on November 17, 2009. An IMAX 3D theatrical re-release played at 300 theaters in North America for one week only beginning September 20, 2013, as part of the film's 75th anniversary. Warner Bros. spent $25 million on advertising. The studio hosted a premiere of the film's first IMAX 3D release on September 15, 2013, from the newly remodeled TCL Chinese Theatre (formerly Grauman's Chinese Theatre, the site of the film's Hollywood premiere) in Hollywood. It was the first to play at the new theater and served as the grand opening of Hollywood's first 3D IMAX screen. It was also shown as a special presentation at the 2013 Toronto International Film Festival. This re-release grossed $5.6 million at the North American box office. In 2013, in preparation for its IMAX 3D release, the film was submitted again to the MPAA for re-classification. According to MPAA rules, a film that has been altered in any way from its original version must be submitted for re-classification, as the 3-D conversion fell within that guideline. Surprisingly, the 3D version received a PG rating for "Some scary moments", although no change was made to the film's original story content. The 2D version still retains its G rating. The film received much acclaim upon its release. Frank Nugent considered the film a "delightful piece of wonder-working which had the youngsters' eyes shining and brought a quietly amused gleam to the wiser ones of the oldsters. Not since Disney's Snow White and the Seven Dwarfs has anything quite so fantastic succeeded half so well." Nugent had issues with some of the film's special effects, writing, "with the best of will and ingenuity, they cannot make a Munchkin or a Flying Monkey that will not still suggest, however vaguely, a Singer's Midget in a Jack Dawn masquerade. Nor can they, without a few betraying jolts and split-screen overlappings, bring down from the sky the great soap bubble in which Glinda rides and roll it smoothly into place." According to Nugent, "Judy Garland's Dorothy is a pert and fresh-faced miss with the wonder-lit eyes of a believer in fairy tales, but the Baum fantasy is at its best when the Scarecrow, the Tin Man, and the Lion are on the move." Leo the Lion is privileged to herald this one with his deepest roar—the one that comes from way down—for seldom if indeed ever has the screen been so successful in its approach to fantasy and extravaganza through flesh-and-blood... handsomely mounted fairy story in Technicolor, with its wealth of humor and homespun philosophy, its stimulus to the imagination, its procession of unforgettable settings, its studding of merry tunes should click solidly at the box-office. Not all reviews were positive. 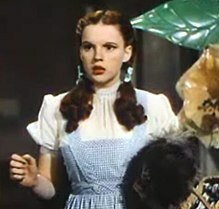 Some moviegoers felt that the 16-year-old Garland was slightly too old to play the little girl who Baum originally intended his Dorothy to be. Russell Maloney of The New Yorker wrote that the film displayed "no trace of imagination, good taste, or ingenuity" and declared it "a stinkeroo," while Otis Ferguson of The New Republic wrote, "It has dwarfs, music, Technicolor, freak characters, and Judy Garland. It can't be expected to have a sense of humor, as well – and as for the light touch of fantasy, it weighs like a pound of fruitcake soaking wet." Still, the film placed seventh on Film Daily's year-end nationwide poll of 542 critics naming the best films of 1939. Writer Salman Rushdie acknowledged "The Wizard of Oz was my very first literary influence" in his 2002 musings about the film. He has written: "When I first saw The Wizard of Oz, it made a writer of me." His first short story, written at the age of 10, was titled "Over the Rainbow". In a 2009 retrospective article about the film, San Francisco Chronicle film critic and author Mick LaSalle declared that the film's "entire Munchkinland sequence, from Dorothy's arrival in Oz to her departure on the yellow brick road, has to be one of the greatest in cinema history – a masterpiece of set design, costuming, choreography, music, lyrics, storytelling, and sheer imagination." On the film critic aggregator site Rotten Tomatoes, the film has an approval rating of 98% based on 111 reviews, with an average score of 9.4/10. The site's critical consensus reads, "An absolute masterpiece whose groundbreaking visuals and deft storytelling are still every bit as resonant, The Wizard of Oz is a must-see film for young and old." At Metacritic, which assigns a normalized rating to reviews, the film received the maximum score of 100 out of 100, based on 4 reviews, indicating "universal acclaim", which, as of August 2017, is matched only by five other films. According to MGM records, during the film's initial release, it earned $2,048,000 in the US and Canada and $969,000 in other countries throughout the world, resulting in total earnings of $3,017,000. While these were considerable earnings, the high production cost, in association with various distribution and other costs, meant the movie initially recorded a loss of $1,145,000 for the studio. It did not show what MGM considered a profit until a 1949 re-release earned an additional $1.5 million (about $16 million today). However, for all the risks and cost that MGM undertook to produce the film, it was considered at least more successful than anyone thought it would be. According to Christopher Finch, author of the Judy Garland biography Rainbow: The Stormy Life of Judy Garland, "Fantasy is always a risk at the box office. The film had been enormously successful as a book, and it had also been a major stage hit, but previous attempts to bring it to the screen had been dismal failures." Finch also writes that after the success of the film, Garland signed a new contract with MGM giving her a substantial increase in salary, making her one of the top-ten box office stars in the United States. Best Music, Original Song "Over the Rainbow"
1999: Rolling Stone's 100 Maverick Movies – No. 20. 1999: Entertainment Weekly's 100 Greatest Films – No. 32. 2000: The Village Voice's 100 Best Films of the 20th Century – No. 14. 2002: Sight & Sound's Greatest Film Poll of Directors ��� No. 41. 2005: Total Film's 100 Greatest Films – No. 83. 2005: ranked among the top ten of the BFI list of the 50 films you should see by the age of 14. 2007: Total Film's 23 Weirdest Films – No. 1. 2007: The Observer ranked the film's songs and music at the top of its list of 50 greatest film soundtracks. Roughly 40 identifiable major differences exist between the original book and the MGM interpretation. An official 1972 sequel, the animated Journey Back to Oz starring Liza Minnelli, daughter of Garland, was produced to commemorate the original film's 35th anniversary. In 1985, Walt Disney Productions released the live-action fantasy film Return to Oz, which starred (and introduced) Fairuza Balk as a young Dorothy Gale. Based loosely on The Marvelous Land of Oz (1904) and Ozma of Oz (1907), it fared rather poorly with critics who were unfamiliar with the Oz books and was not successful at the box office, although it has since become a popular cult film, with many considering it a more loyal and faithful adaptation of what L. Frank Baum envisioned. Andrew Lloyd Webber and Tim Rice wrote a stage musical of the same name, which opened in 2011 at the West End's London Palladium. It features all of the songs from the film plus new songs written by Lloyd Webber and Rice. Lloyd Webber also found Danielle Hope to play Dorothy on the reality show, Over the Rainbow. Another production opened in December 2012 at the Ed Mirvish Theatre in Toronto. A reality TV show, also titled Over the Rainbow, found a Canadian girl, Danielle Wade, to play Dorothy. The Canadian production then began a North American tour in September 2013. An Australian tour will begin at the Lyric Theatre, Queensland Performing Arts Centre in November 2017, followed by a season at the Capitol Theatre, Sydney beginning December 2017. An animated film called Tom and Jerry and the Wizard of Oz was released in 2011 by Warner Home Video, incorporating Tom and Jerry into the story as Dorothy's "protectors". A sequel titled Tom and Jerry: Back to Oz was released on DVD on June 21, 2016. In 2013, Walt Disney Pictures released a spiritual prequel titled Oz the Great and Powerful. It was directed by Sam Raimi, and starred James Franco, Mila Kunis, Rachel Weisz and Michelle Williams. It was the second film based on Baum's Oz series to be produced by Disney, after Return to Oz. It was a commercial success and received a mixed critical reception. In 2014, now-defunct independent film company Clarius Entertainment released a big-budget animated musical film, Legends of Oz: Dorothy's Return, which follows Dorothy's second trip to Oz. The film was a box office bomb and was received negatively by critics largely for its plot and unmemorable musical numbers. Regarding the original Baum storybook, it has been said that "The Wonderful Wizard of Oz is America's greatest and best-loved home grown fairytale. The first totally American fantasy for children, it is one of the most-read children's books ... and despite its many particularly American attributes, including a wizard from Omaha, The Wonderful Wizard of Oz has universal appeal." The film was one inductee of a group of 25 films that inaugurated in 1989 the National Film Registry list, based on at least it being declared by the Library of Congress as the most viewed film on television syndication. In June 2007, the film was listed on UNESCO's Memory of the World Register. The film placed at number 86 on Bravo's 100 Scariest Movie Moments. In 1977, Aljean Harmetz wrote The Making of The Wizard of Oz, a detailed description of the creation of the film based on interviews and research; it was updated in 1989. Because of their iconic stature, the ruby slippers worn by Judy Garland in the film are now among the most treasured and valuable film memorabilia in movie history. The silver slippers that Dorothy wore in the book series were changed to ruby to take advantage of the new Technicolor process. Adrian, MGM's chief costume designer, was responsible for the final design. There are five known pairs of the ruby slippers in existence. After filming, the slippers were stored among the studio's extensive collection of costumes and faded from attention. They were found in the basement of MGM's wardrobe department during preparations for a mammoth auction in 1970. One pair was the highlight of the auction, going for a then unheard of $15,000 to an anonymous buyer, who apparently donated them to the Smithsonian Institution in 1979. Of the four other pairs, one sold for $666,000 at auction in 2000, and another pair was stolen from the Judy Garland Museum in Grand Rapids, Minnesota. On September 4, 2018, the FBI announced that the slippers had been found in Minneapolis, Minnesota. Another, differently styled pair unused in the film was sold at auction with the rest of her collections by owner actress Debbie Reynolds for $510,000 (not including the buyer's premium) in June 2011. For information on the film's impact on LGBT culture in America, see Friend of Dorothy. ^ "The Wizard of Oz". American Film Institute. Retrieved March 9, 2016. ^ a b "The Wizard of Oz (1939)". Box Office Mojo. Retrieved March 19, 2017. ^ "AFI's 100 Years...100 Movies". www.afi.com. Retrieved August 9, 2017. ^ a b Fricke, John (1989). The Wizard of Oz: The Official 50th Anniversary Pictorial History. New York: Warner Books. ISBN 0-446-51446-2. ^ Nugent, Frank S. (August 18, 1939). "The Screen in Review; 'The Wizard of Oz,' Produced by the Wizards of Hollywood, Works Its Magic on the Capitol's Screen – March of Time Features New York at the Music Hall at the Palace". Retrieved August 15, 2014. ^ King, Susan (March 11, 2013). "How did 'Wizard of Oz' fare on its 1939 release?". Los Angeles Times. Retrieved April 24, 2015. ^ a b "To See The Wizard Oz on Stage and Film". Library of Congress. December 15, 2010. Retrieved April 16, 2011. ^ a b "Complete National Recording Registry Listing – Recording Registry – National Recording Preservation Board – Programs at the Library of Congress – Library of Congress". ^ "The Wizard of Oz (Victor Fleming 1939), produced by Metro-Goldwyn-Mayer". UNESCO Memory of the World Programme. Archived from the original on August 5, 2009. Retrieved September 7, 2009. ^ Sibley, Brian (February 10, 1997). "Obituary: Adriana Caselotti". The Independent. London. Retrieved October 8, 2017. ^ Fricke, John; Scarfone, Jay; Stillman, William (1986). The Wizard of Oz: The Official 50th Anniversary Pictorial History. New York, NY: Warner Books, Inc. p. 18. ISBN 0-446-51446-2. ^ a b c d e The Wonderful Wizard of Oz, the Making of a Movie Classic (1990). CBS Television, narrated by Angela Lansbury. Co-produced by John Fricke and Aljean Harmetz. ^ a b c d Aljean Harmetz (2004). The Making of The Wizard of Oz. Hyperion. ISBN 0-7868-8352-9. See the Chapter "Special Effects. ^ Coan, Stephen (December 22, 2011). "KZN's very own screen wizard". The Witness. Retrieved April 24, 2014. ^ a b Warner Bros. "Wizard of Oz Timeline". Warnerbros.com. Archived from the original on September 7, 2007. Retrieved September 10, 2007. ^ Democracy Now. November 25, 2004 Archived November 14, 2007, at the Wayback Machine. ^ Fordin, Hugh (1976). World of Entertainment. City: Avon Books (Mm). ISBN 978-0-380-00754-7. ^ Clarke, Gerald (2001). Get Happy: The Life of Judy Garland. Delta. p. 94. ISBN 0-385-33515-6. ^ The Wonderful Wizard of Oz, the Making of a Movie Classic. CBS Television, 1990, narrated by Angela Lansbury. Co-produced by John Fricke and Aljean Harmetz. ^ Cemetery Guide, Hollywood Remains to Be Seen, Mark Masek. ^ Hearn, Michael Patrick. Keynote address. The International Wizard of Oz Club Centennial convention. Indiana University, August 2000. ^ Smalling, Allen (1989). The Making of the Wizard of Oz: Movie Magic and Studio Power in the Prime of MGM. Hyperion. ISBN 0-7868-8352-9. ^ MacDonald Fraser, George (2003). The Light's on at Signpost. Harper-Collins. ISBN 978-0-00-732563-4. ^ Leopold, Ted (August 25, 2014). "'The Wizard of Oz' at 75: Did you know...?". CNN. Retrieved September 1, 2017. Margaret Hamilton's copper-based makeup as the Wicked Witch was poisonous, so she lived on a liquid diet during the film, and the makeup was carefully cleaned off her each day. ^ Aylesworth, Thomas (1984). History of Movie Musicals. New York City: Gallery Books. p. 97. ISBN 0-8317-4467-7. ^ "It's a twister! 75 years later, Wizard of Oz is still a tornado classic". Washington Post. Retrieved August 23, 2018. ^ Miller, Ron (January 1, 2006). Special Effects: An Introduction to Movie Magic. Twenty-First Century Books. ISBN 978-0-7613-2918-3. ^ Hogan, David J. (June 1, 2014). The Wizard of Oz FAQ: All That's Left to Know About Life, According to Oz. Hal Leonard Corporation. ISBN 978-1-4803-9719-4. ^ a b Harmetz, Aljean (October 1, 2013). The Making of The Wizard of Oz. Chicago Review Press. ISBN 978-1-61374-835-0. ^ Scarfone, Jay; Stillman, William (June 1, 2004). The Wizardry of Oz. Hal Leonard Corporation. ISBN 978-1-61774-843-1. ^ November 25, CBS/AP; 2014; Am, 11:15. ""The Wizard of Oz" Cowardly Lion costume fetches $3 million at auction". Retrieved August 23, 2018. ^ Rushdie, Salman (May 27, 1992). The Wizard of Oz. Macmillan. ISBN 978-0-85170-300-8. ^ Eschner, Kat. "The Crazy Tricks Early Filmmakers Used To Fake Snow". Smithsonian. Retrieved August 21, 2018. ^ McCulloch, Jock; Tweedale, Geoffrey (July 24, 2008). Defending the Indefensible: The Global Asbestos Industry and its Fight for Survival. OUP Oxford. ISBN 978-0-19-156008-8. ^ "The Wizard of Oz [Original Motion Picture Soundtrack] – Original Soundtrack – Songs, Reviews, Credits, Awards – AllMusic". AllMusic. ^ Warner Bros. 2005 The Wizard of Oz Deluxe DVD edition, program notes and audio extras. ^ The Making of the Wizard of Oz – Movie Magic and Studio Power in the Prime of MGM – and the Miracle of Production #1060, 10th Edition, Bantam Doubleday Dell Publishing Group, Inc./Random House, 1989. ^ Jim's "Wizard of Oz" Website Directory. ""The Wizard of Oz"... A Movie Timeline". geocities.com. Archived from the original on November 14, 2007. Retrieved September 10, 2007. ^ Williams, Scott (July 21, 2009). "Hello, yellow brick road". Milwaukee Journal Sentinel. Retrieved October 21, 2011. John Fricke, a historian who has written books about The Wizard of Oz, said that MGM executives arranged advance screenings in a handful of small communities to find out how audiences would respond to the musical adventure, which cost nearly $3 million to produce. Fricke said he believes the first showings were on the 11th, one day before Oconomowoc's preview, on Cape Cod in Dennis, Massachusetts, and in another southeastern Wisconsin community, Kenosha. ^ a b Cisar, Katjusa (August 18, 2009). "No Place Like Home: 'Wizard of Oz' premiered here 70 years ago". Madison.com. Retrieved October 21, 2011. 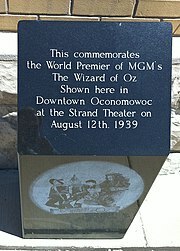 Oconomowoc's Strand Theatre was one of three small-town movie theaters across the country where "Oz" premiered in the days prior to its official Hollywood opening on Aug. 15, 1939 ... It's possible that one of the other two test sites – Kenosha and the Cape Cinema in Dennis, Massachusetts – screened the film a day earlier, but Oconomowoc is the only one to lay claim and embrace the world premiere as its own. ^ "Beloved movie's premiere was far from L.A. limelight". Wisconsin State Journal. August 12, 2009. p. a2. ^ "Grauman's Chinese Makeover: How the Hollywood Landmark Will Be Revamped". The Hollywood Reporter. ^ Brooks, Tim; Marsh, Earle (2003). "Ford Star Jubilee". The Complete Directory to Prime Time Cable and Network Shows 1946 – present. Ballantine Books. p. 425. ISBN 0-345-45542-8. Last telecast: November 3, 1956 ... The last telecast of Ford Star Jubilee, however, was really something special. It was the first airing of what later became a television tradition – Garland's classic 1939 film The Wizard of Oz, with Judy's 10-year-old daughter Liza Minnelli and Lahr (the Cowardly Lion from the film) on hand to introduce it. ^ "WOO Super 8". Retrieved July 7, 2014. ^ "MGM/CBS Home Video ad". Billboard. November 22, 1980. Retrieved April 20, 2011. ^ Julien WILK (February 28, 2010). "LaserDisc Database – Search: Wizard of Oz". Lddb.com. Retrieved March 6, 2010. ^ "WOO Beta". Retrieved July 7, 2014. ^ "WOO CED Exclusive". Retrieved July 7, 2014. ^ "WOO VCD". Retrieved July 7, 2014. ^ "THE WIZARD OF OZ (1939) 3D". Prime Focus World. ^ "Off To See The Wizards: HDD Gets An In Depth Look at the Restoration of 'The Wizard of Oz' (UPDATED – Before and After Pics!)". Highdefdigest.com. September 11, 2009. Retrieved March 6, 2010. ^ a b "'Wizard of Oz' coming back to theaters for IMAX 3D run". Retrieved June 4, 2013. ^ "'Wizard of Oz' Goes 3D for W.B. 90th Celebration". ETonline.com. Retrieved November 2, 2012. ^ "WOO Best Buy SteelBook Exclusive". Archived from the original on July 15, 2014. Retrieved July 7, 2014. ^ "WOO Target Exclusive". Retrieved July 7, 2014. ^ Cruz, Gilbert (August 30, 2010). "The Wizard of Oz". Time. Retrieved January 21, 2011. ^ "THE WIZARD OF OZ (1939, U.S.)". Kiddiematinee.com. November 3, 1956. Archived from the original on January 12, 2010. Retrieved March 6, 2010. ^ "The Wizard of Oz (2002 re-issue) (2002) – Box Office Mojo". boxofficemojo.com. ^ "The Wizard of Oz 70th Anniversary Encore Event". Creative Loading. ^ Graser, Marc (August 28, 2013). "Warner Bros. Plans $25 Million Campaign Around 'The Wizard of Oz'". Variety. Retrieved September 11, 2013. ^ "The Wizard of Oz (3D/IMAX) (2013)". Box Office Mojo. October 17, 2013. Retrieved August 25, 2017. ^ Hicks, Chris (August 14, 2013). "Chris Hicks: 'The Wizard of Oz' reissue could signal the end of the G rating". ^ "TCM Presents The Wizard of Oz". Variety. Retrieved September 6, 2015. ^ a b Nugent, Frank S. (August 18, 1939). "The Wizard of Oz, Produced by the Wizards of Hollywood, Works Its Magic on the Capitol's Screen". The New York Times. Retrieved October 21, 2011. ^ Flinn, John C. (August 16, 1939). "Review: 'The Wizard of Oz'". Variety. Retrieved September 22, 2015. ^ "The Wizard of Oz". Harrison's Reports. New York: Harrison's Reports, Inc.: 134 August 26, 1939. ^ "Reviews: The Wizard of Oz". Film Daily: 6. August 10, 1939. ^ Overbey, Erin (March 8, 2013). "The Allure of Oz". The New Yorker. Retrieved September 22, 2015. ^ Meyerson, Harold; Harburg, Ernie (1995). Who Put the Rainbow in the Wizard of Oz? : Yip Harburg, lyricist. University of Michigan Press. pp. 156–157. ISBN 978-0-472-08312-1. ^ ""Ten Best" of 1939". Film Daily: 1. January 12, 1940. ^ Ebert, Roger (December 22, 1996). "The Wizard of Oz (1939)". rogerebert.com. Retrieved August 30, 2012. ^ Rushdie, Salman (2000). The Wizard of Oz. BFI Pub. ISBN 0-85170-300-3. Retrieved August 30, 2012. ^ a b Rushdie, Salman (2003). Step Across This Line. Random House. ISBN 0-679-78349-0. ^ LaSalle, Mick (October 30, 2009). "Thoughts on 'The Wizard of Oz' at 70". The San Francisco Chronicle. Retrieved February 25, 2010. ^ "The Wizard of Oz". Rotten Tomatoes. Retrieved November 22, 2014. ^ "The Wizard of Oz Reviews". Metacritic. Retrieved December 20, 2013. ^ Finch, Christofer (1975). Rainbow: The Stormy Life Of Judy Garland. Ballantine Books. p. 84. ISBN 978-0-345-28407-5. ^ "The 12th Academy Awards (1940) Nominees and Winners". Academy of Motion Picture Arts and Sciences. Retrieved January 23, 2014. ^ "100 Maverick Movies in 100 Years from Rolling Stone". Filmsite.org. Retrieved March 6, 2010. ^ "The 100 Greatest Movies of All Time by Entertainment Weekly". Filmsite.org. Retrieved March 6, 2010. ^ "100 Best Films – Village Voice". Filmsite.org. January 4, 2000. Archived from the original on March 31, 2014. Retrieved March 6, 2010. ^ "Sight & Sound | Top Ten Poll 2002 – The rest of the directors' list". BFI. September 5, 2006. Retrieved March 6, 2010. ^ Total Film (October 24, 2005). "Film news Who is the greatest?". TotalFilm.com. Retrieved March 6, 2010. ^ "The 50 films you should see by the age of 14". Daily Mail. London. July 20, 2005. Retrieved September 18, 2009. ^ "Total Film's 23 Weirdest Films of All Time on Lists of Bests". Listsofbests.com. April 6, 2007. Archived from the original on February 7, 2009. Retrieved March 6, 2010. ^ The Observer Music Monthly (March 18, 2007). "The 50 Greatest Film Soundtracks". The Guardian. London. Retrieved September 10, 2007. ^ Jahangir, Rumeana (March 17, 2009). "Secrets of the Wizard of Oz". BBC. Retrieved March 18, 2009. ^ Rhodes, Jesse (January 2009). "There's No Place Like Home". Smithsonian. 39 (10). p. 25. ^ "The Wizard of Oz Production Timeline". The first official sequel to The Wizard of Oz is released, an animated film titled Journey Back to Oz. ^ "Flashback Exclusive: A 'Return to Oz'". ET Online. March 5, 2013. Retrieved March 15, 2013. ^ Gioia, Michael and Andrew Gans. "North American Tour of The Wizard of Oz, Starring Danielle Wade, Kicks Off Sept. 10 in Las Vegas" Archived July 18, 2014, at the Wayback Machine, Playbill, September 10, 2013. ^ "The World's Favourite Musical Returns To Australia". Wizard of Oz The Musical. The Really Useful Group. Retrieved July 14, 2017. ^ "Oz The Great and Powerful (2013)". Box Office Mojo. August 28, 2013. ^ "Oz the Great and Powerful (2013)". Rotten Tomatoes. March 5, 2013. Retrieved June 17, 2016. ^ Tampubolon, Rama (May 7, 2013). "3D Animated Movie, LEGENDS OF OZ: DOROTHY'S RETURN, Voice Starring Lea Michele, Opens May 9, 2014 And It's Coming To Cannes". Rama's Screen. Retrieved May 9, 2014. ^ "The Wizard of Oz: An American Fairy Tale". ^ "UNESCO chooses The Wizard of Oz as USA's Memory of the World". UNESCO. Retrieved January 23, 2014. ^ "The 100 Scariest Movie Moments". Bravotv.com. Archived from the original on July 13, 2006. Retrieved January 23, 2014. ^ Dwight Blocker Bowers (January 2010). "The Ruby Slippers: Inventing an American Icon". The Lemelson Center. Archived from the original on April 20, 2010. Retrieved April 28, 2010. ^ Burke, Monte (December 3, 2008). "Inside The Search For Dorothy's Slippers". Forbes. Retrieved April 28, 2010. ^ Frank), Baum, L. Frank (Lyman; Wallace, Denslow, William; Albert), Hamlin, Fred (Frederic; Yipsel), Harburg, E. Y. (Edgar; Harold, Arlen, (April 21, 2000). "To See the Wizard – The Wizard of Oz: An American Fairy Tale – Exhibitions – Library of Congress". www.loc.gov. ^ Thomas, Rhys (1989). The Ruby Slippers of Oz. Tale Weaver Pub. ISBN 0-942139-09-7. ^ Rosenblatt, Kalhan. 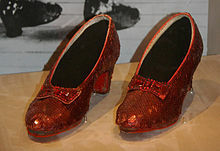 "Dorothy's stolen ruby slippers from 'The Wizard of Oz' found by FBI after 13 years", NBC News. September 4, 2018. ^ "Debbie Reynolds Auction Breaks Up Historic Hollywood Collection". Archived from the original on March 18, 2014. Retrieved January 23, 2014. Wikimedia Commons has media related to The Wizard of Oz (film). Finding aid author: John N. Gillespie (2013). "The Wizard of Oz recordings and recording logs". Prepared for the L. Tom Perry Special Collections, Provo, UT. Retrieved May 16, 2016.